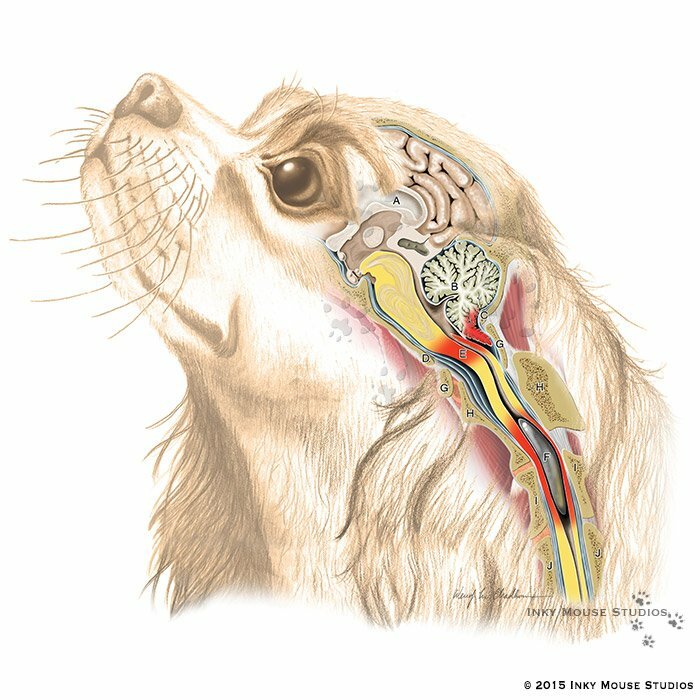 Veterinary anatomical illustration of a neurological disorder called canine syringomyelia in a Cavalier King Charles Spaniel. Cavalier King Charles Spaniels seem to be particularly prone to this disorder, which is caused by a lack of sufficient space in the skull that contains the cerebellum. This anatomical anomaly causes varying degrees of changes within the structure of the brain and spinal cord, which are only detectable by MRI. The symptoms of this disease are also widely ranging from mild, such as neck scratching, to severe pain and limb weakness. Loss of the normal round shape of the cerebellum, caused by a misshaped occipital bone. Displacement of the cerebellum into and through the foramen magnum, causing compression of the brain stem and spinal cord. Kinking of the medulla, caused by the cerebellum herniation and misshapen foramen magnum. Formation of syrinx within the spinal cord, caused by a back-up of CSF within the spinal canal. Dilation of the ventricles within the cerebrum, caused by a back-up of CSF within the brain.